One of the easiest and most effective special card folds I have ever made is an Explosion Card. I love to make them when I want to surprise someone with a special greeting. 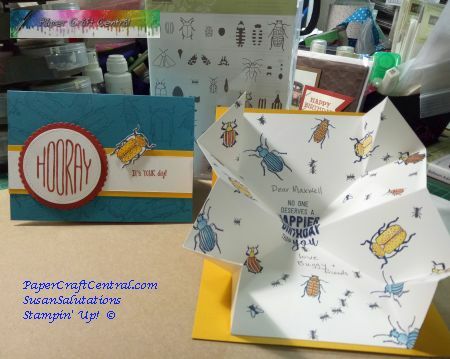 One friend loves bugs, for example, so I took the (now retired ) Beetles and Bugs stamp set from Stampin' Up! made him one crawling with them! 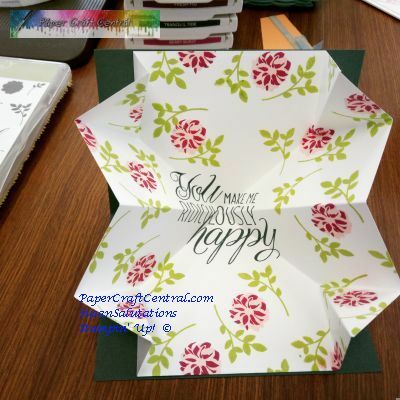 Talk about special greeting card folds! Lol! You can make them much more beautiful than this, however. I love how this one turned out, using the Lovely Friends stamp set. Here's How to Make a Special Card Fold Explosion Card. These are the fancy fold card tutorial written instructions. There is a video below them in case you like to see the way this works. 1. Choose a card base. An ordinary sized card base is fine to use for this project. Mine is 15cm x 21cm (about 6" x 8.25") folded in half. 3. Stamp your design on it. I usually stamp my greeting in the middle of the piece, then use decorative stamps around the sentiment. 4. Decorate the front of your card. Lay your stamped square face up in front of you, with the sentiment reading the right way up. 1. Fold the square corner to corner, diagonally. Crease well. You can even fold this line back on itself and crease it. Fold out flat. 2. Do the same with the opposite corner - fold diagonally, crease well, fold backwards on itself, crease. Unfold the square to be flat again, the right way up. 3. Now fold the bottom edge up to meet the top edge, crease horizontally. Fold back on itself and then refold it up the right way again. 4. Invert the edge points of the horizontal line and allow the cupped paper to meet in the middle. Crease the folds flat. 5. Now push each corner in to make a cup that folds along the diagonal lines. The points will meet in the middle. Crease the folds flat. To adhere your explosion piece inside the card, place adhesive along the flat house face and position it inside the card, with the point of the house facing towards the card base fold line. Keep the point a little distance from the fold line to give it room to move. Run the adhesive down the middle of the house, from the roof tip to the floor, in a straight line. Enjoy surprising and delighting someone with your finished explosion greeting card.